Last year, Bobby’s stepmother Alice gave me the most beautiful cookbook by Luke Nguyen, My Vietnam: Stories and Recipes. 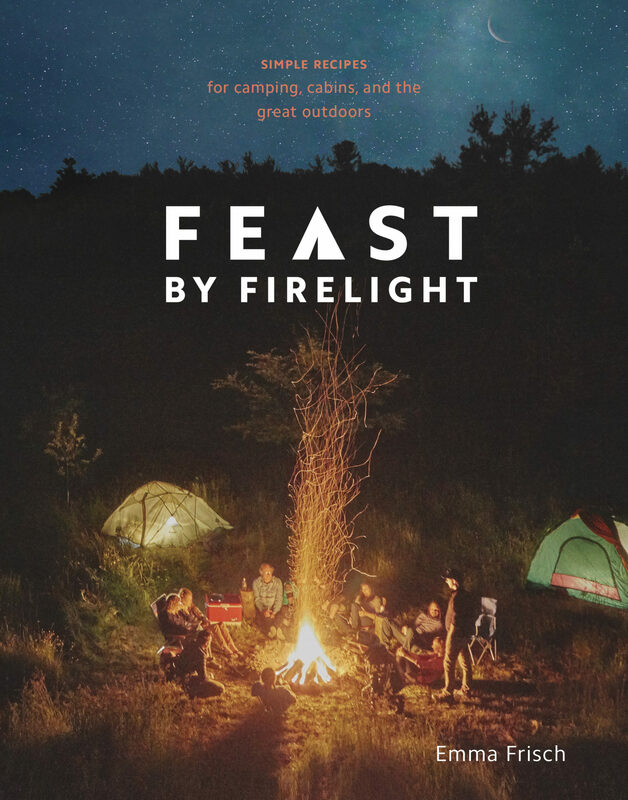 This book is an authentic memoir of Vietnamese food, which often called for exotic ingredients I have yet to decipher and track down in the local Asian markets. Practicality aside, I often disappear into the book’s beautiful stories and imagery, conjuring memories of my own journeys through Vietnam in 2007. What a colorful, bustling country drenched in cooking aromas on every street corner. I finally discovered a recipe that I could sort-of recreate with my own pantry: Chargrilled Squid in Oyster Sauce. 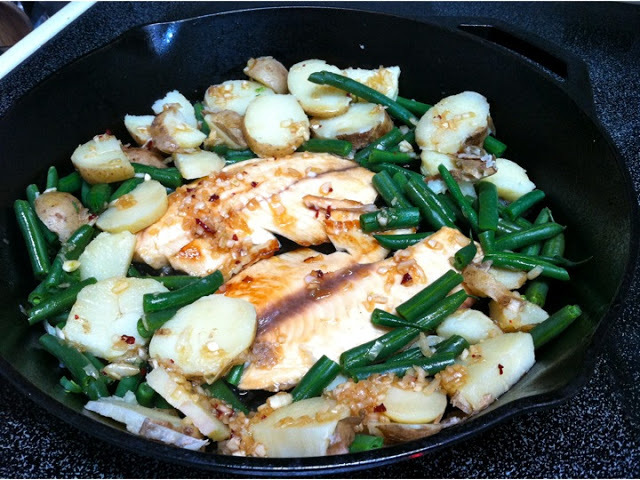 Here is my variation, with tilapia and green beans frozen from earlier supermarket runs and harvests, and fresh potatoes from our farm share. 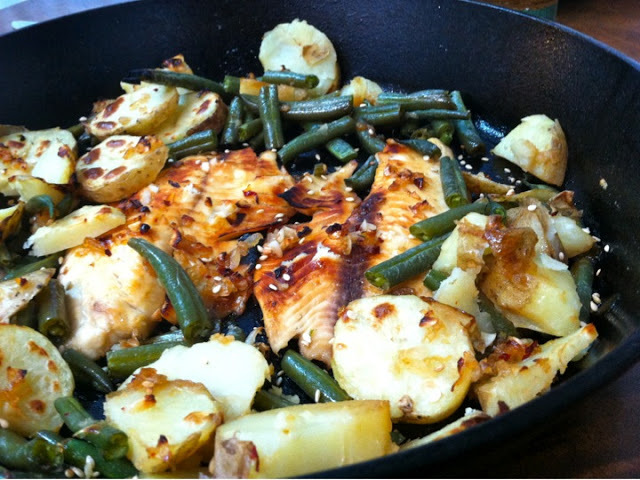 The result is a healthy, sweet and smoky fish with a hearty vegetable pairing. 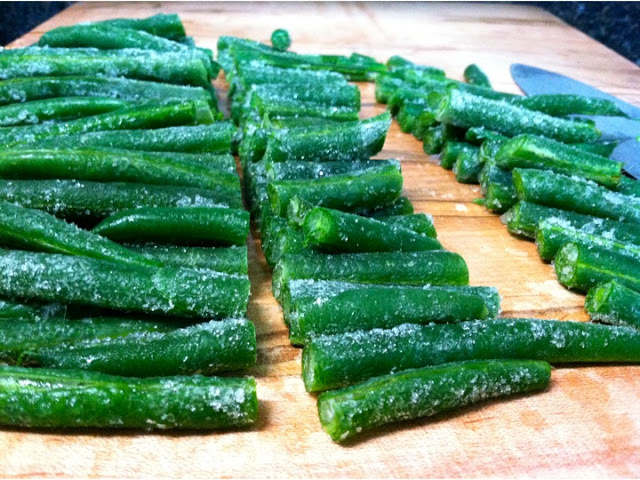 Frozen green beans are easy to chop when still frozen! 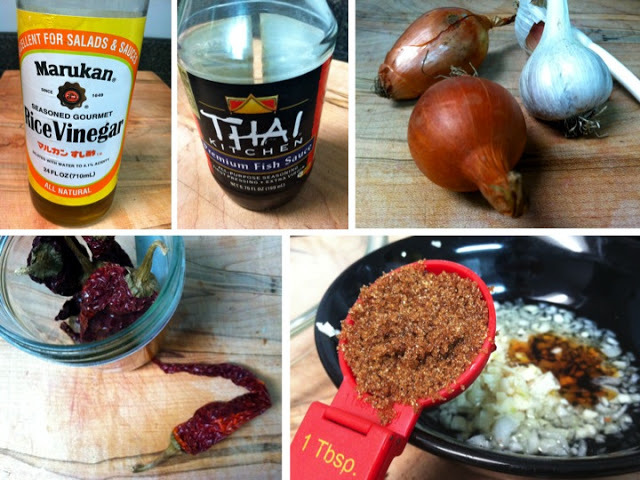 Whisk together the rice wine vinegar, minced shallot, brown sugar, garlic, fish sauce, sesame oil and chili to make the fish marinade. If defrosting your fish, place it in a bowl of warm water for about 1 hour to bring it to room temperature. Rinse the fish and pat it dry with paper towel. Put the fish in a container or deep dish and pour the marinade over the fish. 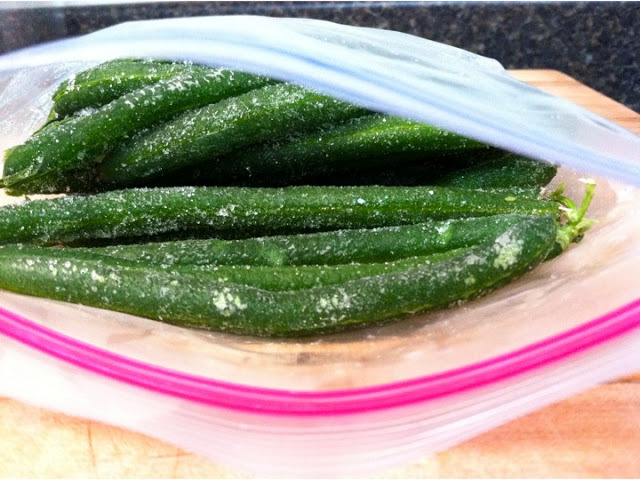 Cover the bowl or container with a plate or plastic wrap, and refrigerate for about 30 minutes. Flip the fish and continue marinating for about 30 more minutes. 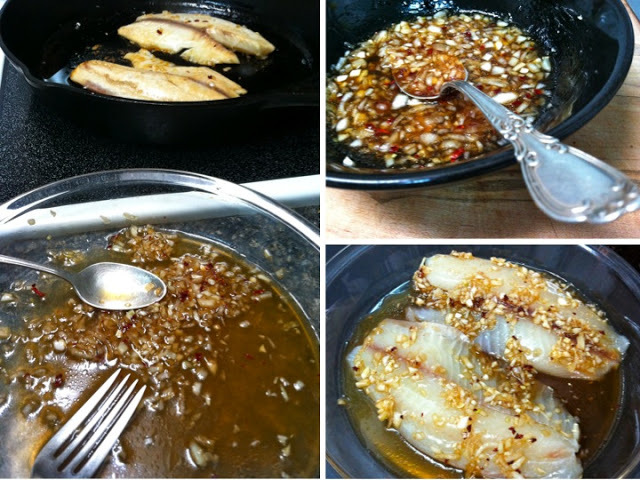 (You can marinate for even longer, which will add more flavor and make the fish juicier). 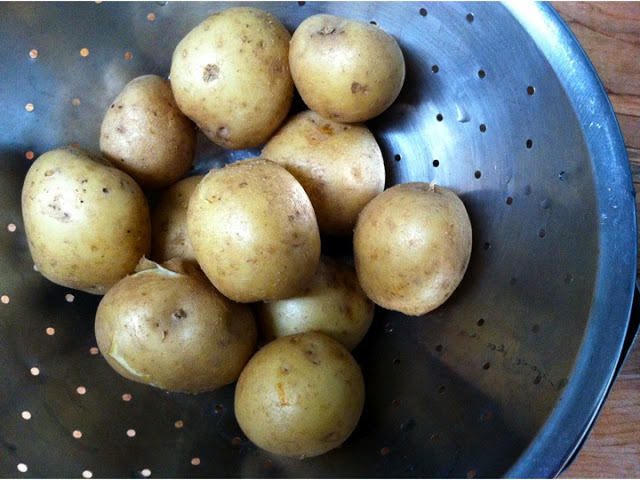 Meanwhile, put the potatoes in a medium pot of cold water and bring the water to a boil. Boil for about 15 minutes or until the potatoes are fork tender. Drain the potatoes and chop them into quarters. Set aside. To steam the green beans, add about 1 inch of water to a medium pot or saucepan. Add the green beans and heat the water over medium. Allow the beans to steam for about 10 minutes, or until fork tender. (If you have a steaming basket, you can do the same but place the green beans in the basket, over the water). Remove the fish from the refrigerator. 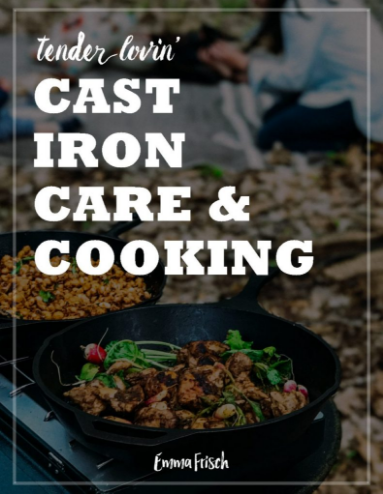 In a cast iron skillet or frying pan (ideally oven proof), heat 2 tablespoons of vegetable oil over high heat. 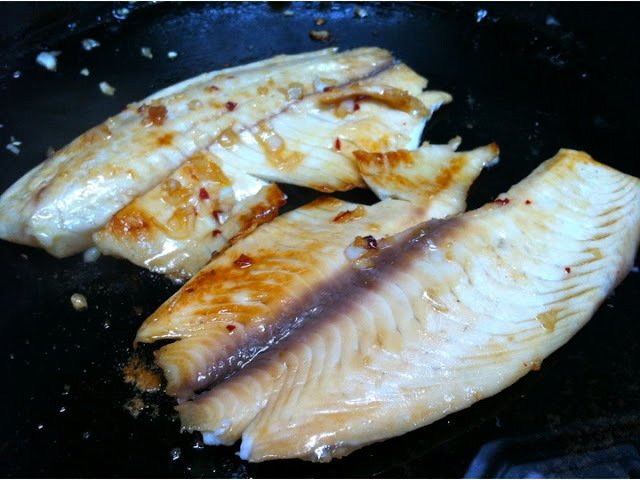 Remove the fish from the marinade and add it to the pan, searing each side for 2 minutes until the outside is browned. Remove the pan from the heat. If you did not use an oven proof pan, transfer the fish to a baking dish. 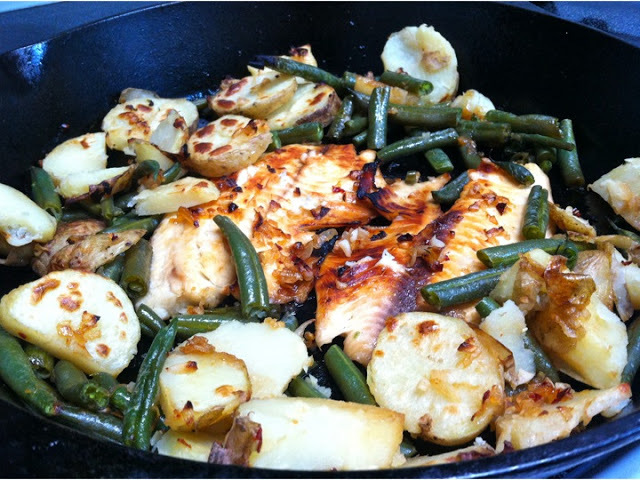 Surround the fish in the oven-proof skillet (or the baking dish) with the potatoes and green beans. Pour the marinade over the vegetables and fish. Place the dish in the oven and bake for 7 minutes. After 7 minutes, turn the broiler to high (or increase the oven temperature to 450) and bake for 7 more minutes, until the fish is nicely charred and crisped. 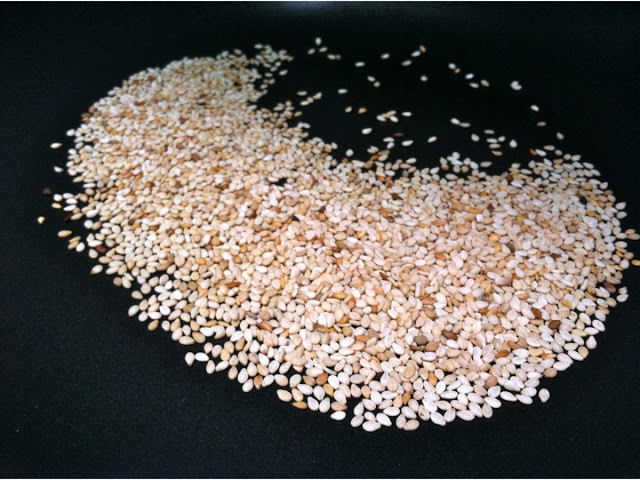 While the dish is cooling, toast the sesame seeds in a dry pan over medium heat. When they begin to pop, remove them from the heat and sprinkle over the Vietnamese Charbroiled Tilapia with Potatoes and Green Beans.